On our long Europe holiday which we were starting in Italy and were going to Austria next, we were thinking where to go after Austria. Our final destination was Brussels since we had to fly out of there and we wanted to go to Amsterdam as well, so we had to pick either Germany or Czech Republic. We dropped Germany as it needs more time and we decided to visit it later. So here we were, heading out from Austria and going to Czech. 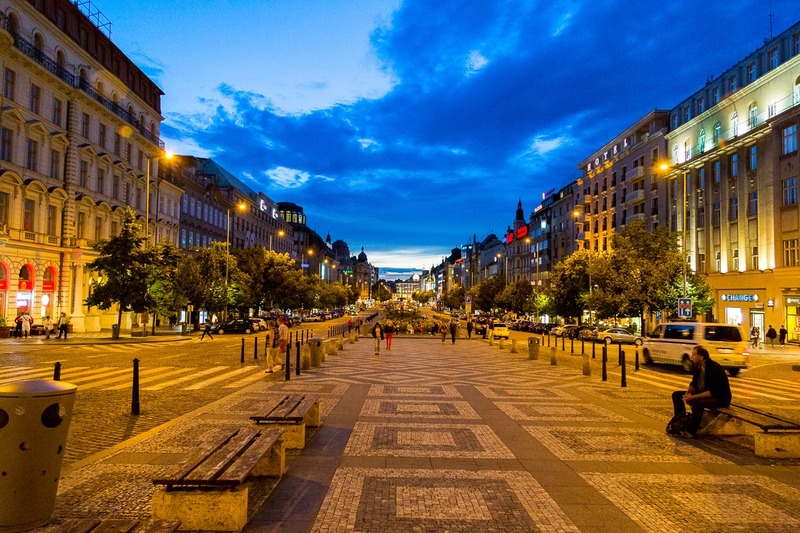 Czech Republic isn't as developed as other European countries, but is charming and beautiful. They have their own currency, Czech Koruna, but are under the Schengen visa agreement. This place has a somewhat Russian feel to it, well, I have never been to Russia, but I felt so. Rick Steve's walk through old town is a pretty good guide to walk around. Check the days on which certain castles, museums are closed. 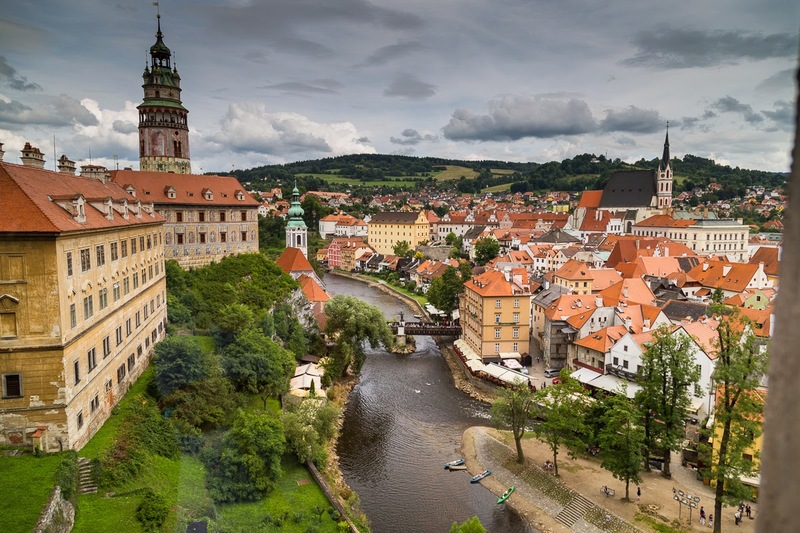 We luckily did so, else would have missed Cesky Krumlov. Best Indian and Thai food on my Europe trip was in Prague. Take a day pass for local transport. The old town is pretty much walk-able though. Google Maps are an excellent resource for figuring out public transport connections. We arrived late around midnight. We had booked our K&K Fenix hotel through hotwire and it was pretty good. It was right in the middle of Old Town and a very short distance from the main train station, Praha hlavní nádraží. On our way, we saw a 24-hour Indian grocery shop which we explored later ;) Anyway, we reached our hotel and I luckily looked up online for day tours to Cesky Krumlov and it turned out that the tours don't happen on Monday, so we had only the next day as an option. We quickly booked out tour. 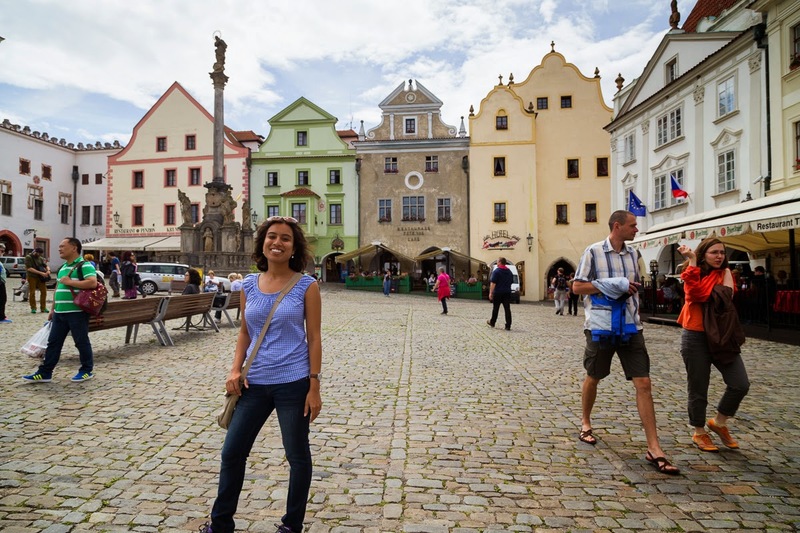 I usually never take tours and such and prefer DIY trips, but driving in Czech was not recommended and public transport wasn't very convenient either with a few train changes and long connections. So, we crashed for the night ready to explore Cesky Krumlov the next day. We booked a day tour with a local sightseeing company. 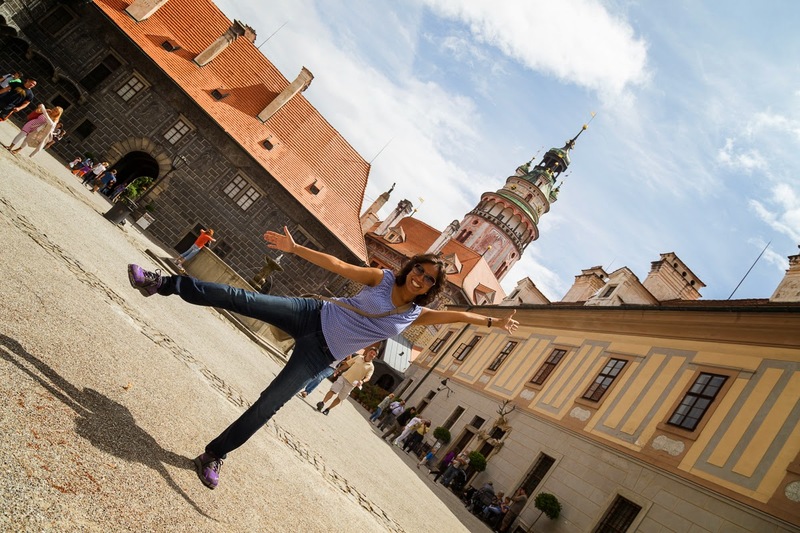 We left at 9 am and it took us about three hours to get to Cesky Krumlov. It was a very cute little small town with a small castle. The whole town is a UNESCO World Heritage Site. We took the tour of the castle and it wasn't as great as any of the palaces in Vienna, but still good enough to deserve a visit. The town was very pretty. Situated on the banks of Vltava river, the architecture is amazing and there are small shops that line up the streets. We strolled around the town and listened to some excellent local singers performing on the streets. Some crepes looked delicious, but we had to skip those, sadly. There was a bell tower next to the castle and we climbed up the stairs to get a view of the city from the top. 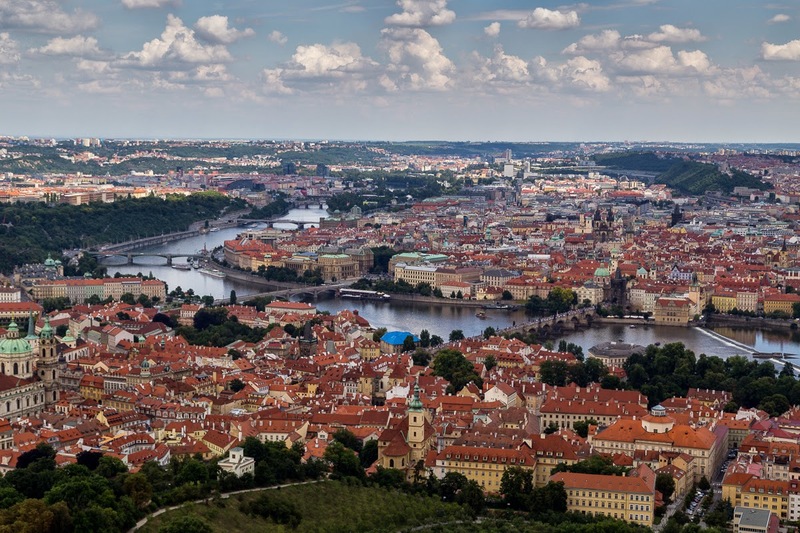 The red-roofed houses and shops, along with the winding Vltava river made for a great view. Some people indulged in kayaking and rafting in the Vltava river as well, but we were tied to the tour and couldn't. Overall, I just felt that this tiny town was very different than all the other cities and town we had visited so far and the street artists and singer here were far better than I had seen anywhere else. Also, the famous Budweiser beer comes from a small town called Cesky Budweis, or so it is believed. I saw a lot of people trying the local beer here. We returned around 7 pm or so and headed straight to the Lal Qila Indian restaurant, walking distance from our hotel. Superb find. Five stars. We ordered dal makhni and naan, with salty lassi. After we were done, we wanted to reach our hotels asap to watch the FIFA world cup final. On our walk back, we saw a lot of sports bars and clubs with big screens and flooded with people. The atmosphere was very exciting. We reached our hotel and watched Germany lift the world cup in a truly deserving win. Prague looks beautiful at night, when all the buildings light up. Definitely worth a long walk. Our morning started with a 8 mile run along the Vltava river. It was a great way to see the city. It got us out of the old town area and we were running along the river in a more residential area. The weather was perfect and it was a great way to see the city and to start your day. After our run, we lost our way back to the hotel and then after a few missed turns and asking around, we finally made it to our hotel just in time to stuff ourselves with some breakfast. Now it was time to get ready and head towards the Prague castle. It is still the official residence and office of the Czech President. The queue for tickets was long, but we got tickets for 2 pm tour of the Vitus Cathedral. It may be worthwhile to get your tickets online beforehand. Cathedral itself boasts of some great history and its Gothic architecture is very impressive. The cathedral was half built in Gothic style for many centuries and then the other half was finished in Baroque style. It is really beautiful inside. 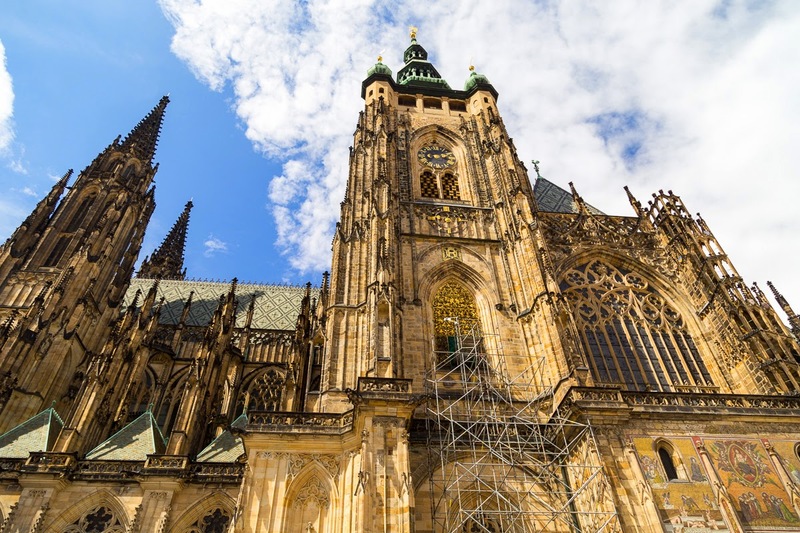 It is a working cathedral even though majority of the Czech population doesn't follow any religion. The Prague castle is huge and very majestic. We walked around the castle for a bit and took in some great views of the city from here. After spending about a couple of hours here, we took tram back to the old town. While hunting for lunch, we saw a Thai restaurant, Buddha Bar and decided to have lunch. Again, excellent Thai food. We ordered panang curry and basil fried rice. It was around 5 pm and the weather was pleasant. We decided to take Rick Steve's walking tour of the old town. 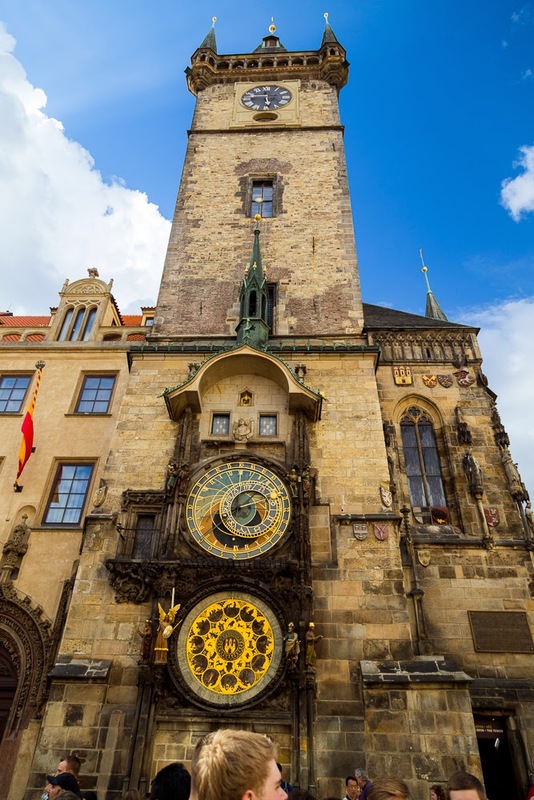 We walked around and saw the Astronomical clock, old town square, Powder Tower and other touristy stuff. 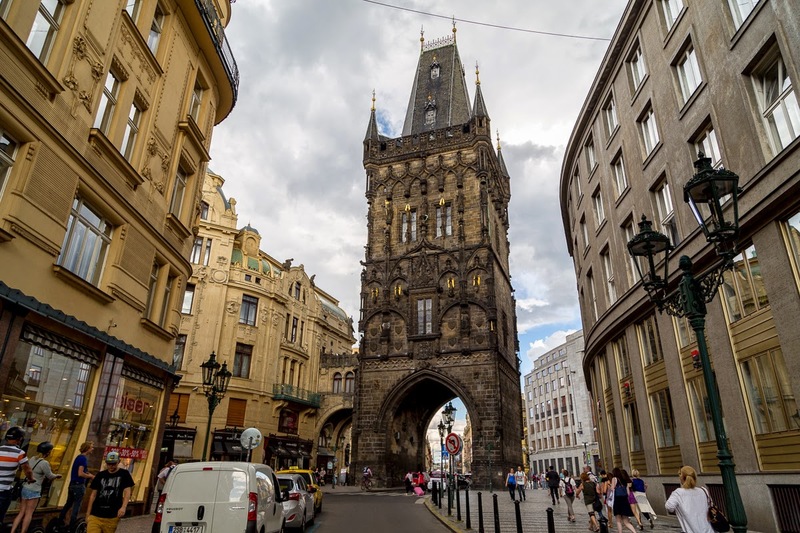 The powder tower is one of the gates of the old city and it stands in striking contrast with all the other surrounding modern architecture. And it is called so because it was used to store gun powder. As far as astronomical clock goes, well, I couldn't figure out how it works, but it looked pretty complicated and all the tiny statues next to the dial have some significance, which I don't remember anymore. 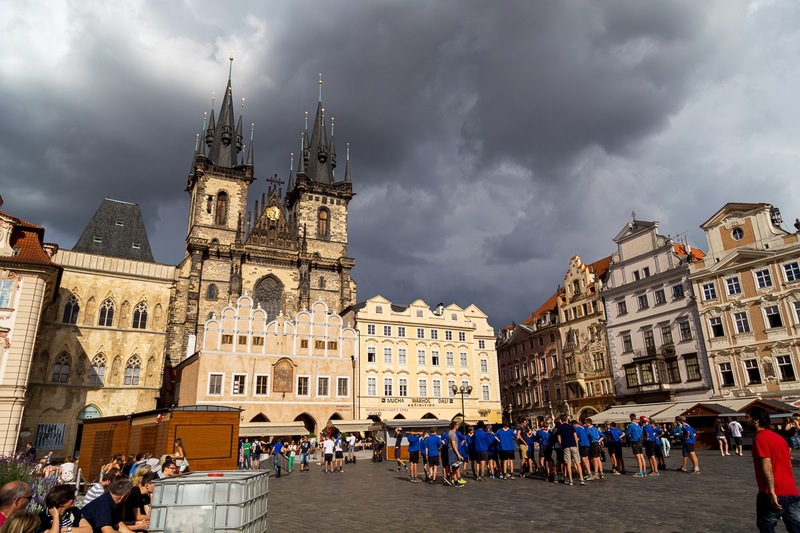 The old town square was a perfect place to relax. You could see a lot of significant structures from here. We didn't step inside, but the Gothic Tyn Church is also quite popular. The square is centered around a very interesting statue of Jan Hus. From here we walked through narrow winding streets full of people and ended up at the Charles bridge. What beauty! It is a very old pedestrian only bridge. 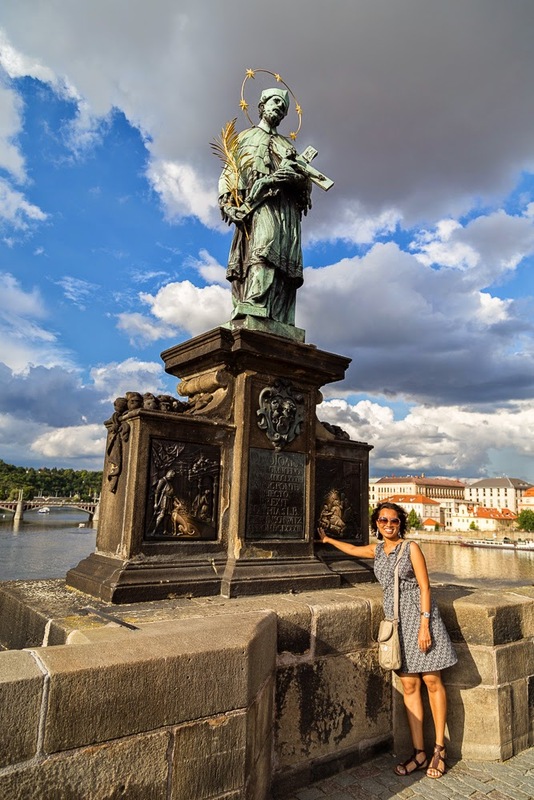 Close to the tower end of the bridge is the statue of Charles IV who was one of the great emperors of Czech and he was the founder of the famous Charles University. His statue is surrounded by four ladies symbolizing four subjects, arts, medicine, law and theology. On the bridge, we went to the St. John's statue and made a wish, now I don't remember what it was., but a lot of people do so. There is a very interesting folktale associated with it. Look it up online. Then we decided to the climb the Charles tower and enjoy some views of the city. Also,don't miss the dancing building while you are walking around the city. We got tickets for our evening boat ride on the Vltava river and decided to have dinner before that. So, we went straight to Lal Qila again and had sumptuous desi meal before taking a tram to the pier for our cruise. Our cruise boat was really bad. Filled with spiders. So we had no choice but to stand outside on the deck and enjoy the views. The view were great , nevertheless. One thing I noticed in Prague was that there are spiders everywhere. 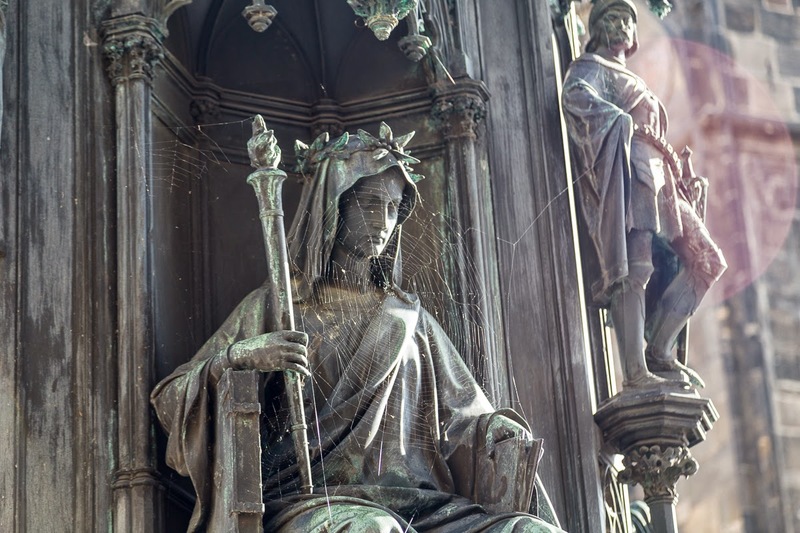 All the statues, bridges, boats, castles had huge cobwebs. Anyhow, after taking some good pictures of the city at night, we headed back to our hotel to call it a day. Walking around the old town at night was fun too. 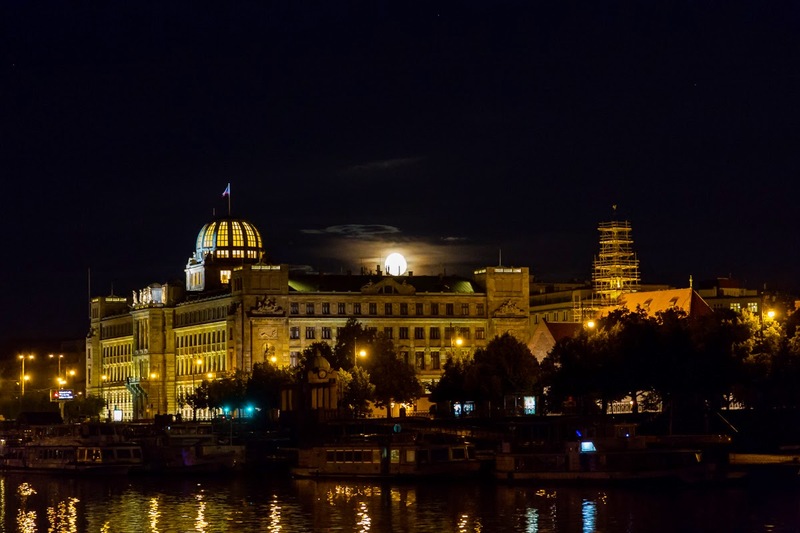 Beautifully lit buildings, especially along the Vltava river, made for some great views. We had decided to visit Kutna Hora on this day. But we realized it might be too rushed, given we had to board the 6 pm train to Amsterdam and more importantly, we got lazy. We took a tram to the Petrin Tower. Google maps to the rescue again. It is like a mini Eiffel tower. You have to take funicular up to the base of the tower and that is included in your public transport day pass. We climbed up the tower for some amazing views of the city. We could see the old town as well as the castle and the monastery form here. Took some nice panoramic pictures and took a stroll in the gardens. Very well kept and all the tree shade was a relief from the hot and scorching sun. 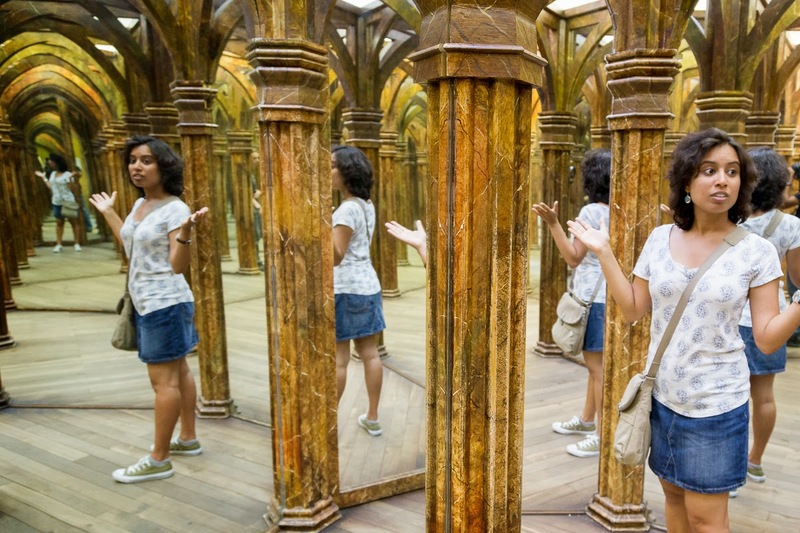 There was a mirror maze close by and it was nice but very small. Wasn't a maze either, just one passage. I would have been more excited had it been like Jantar Mantar and I would have had to find my way out of there. But I guess they wanted to keep things simple for kids. We got back and for lunch we tried a new Indian restaurant, Bombay Express. Quick and good food. I don't remember what we ordered but it was nice. After this, we whiled away our time at a coffee shop and strolled in the streets of the old town. Very busy market full of people. By evening, it was time to pack our bags and head out to the main station for our train to Amsterdam. 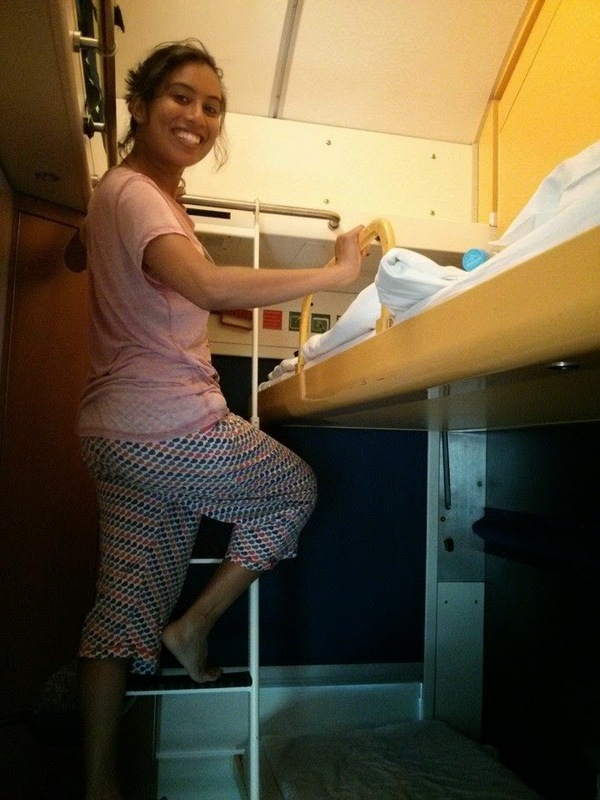 It was an overnight journey and we had booked our private AC I cabin. 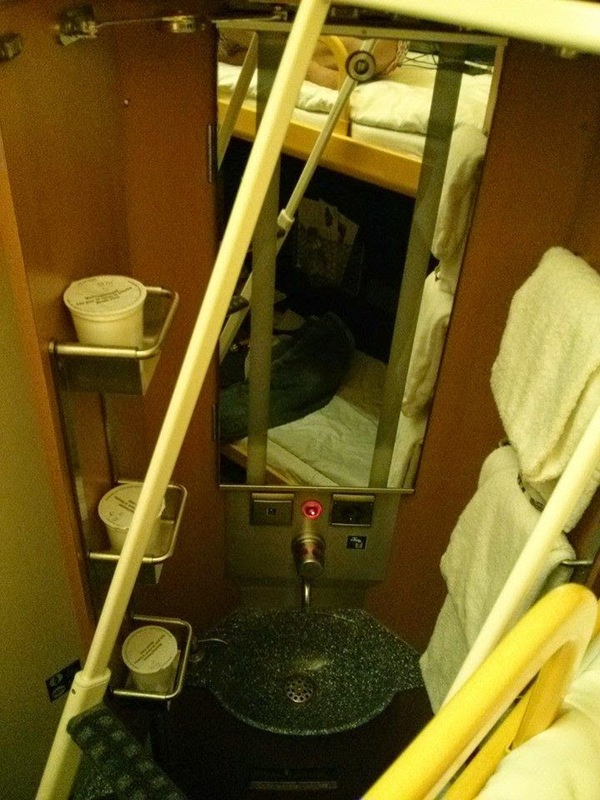 It had a couple of bunk beds and a private wash basin. It was very comfortable and it was the highlight of our trip. Plus the washrooms were very neat and clean. Only thing was that till they turned on the air conditioners, it had become so stuffy and hot, that all the men in our bogie were shirtless. I am not complaining, lol. We wanted to visit Kutna Hora on Day 3, but since we hadn't really planned it earlier, we ditched it.